FA CUP winner and LEAGUE CUP winner qualify for the UEFA Europa League. In the event of a points tie the following will apply: 1. Goal difference. 2. Most scored goals. 3. If two or more clubs have the same goal difference and have scored the same Number of goals they shall be deemed to occupy the same position in the table. 4. Tie-breaker (only for first place, qualification to European competitions and relegation): one or more games at a neutral venue to settle teams league positions if they can not be determined by rules for classification. Get all of Liverpool latest football results for every football game they have played. 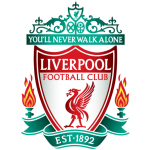 See how Liverpool has gotten on in the 2018/2019 league tables, cup competitions and friendly games including the Premier League, Carabao Cup, FA Cup & Champions League football tournaments. Get every football score, football fixture and football stats for Liverpool in the 2018-2019 football season only at ScoresPro - the #1 Football livescore website for Liverpool! Get the latest Liverpool football scores and all of the Liverpool stats for all Premier League, Carabao Cup, FA Cup & Champions League games in the 2018-2019 season only at ScoresPro, the #1 football & soccer livescore website for Liverpool football!